Ibiza is a sophisticated and bold addition to your outdoor space. It is reminiscent of the laid back but edgy Mediterranean locale that it shares its name with. Solid Grade-A Teak and gorgeous Sunbrella® Cushions make this outdoor collection not only a stunning looking set of furniture, but also a comfortable, versatile collection as well. Comes with FREE Sunbrella® cushions as shown! Unwind in your own private getaway spot, nestled alongside your creature comforts with the Ibiza Teak Outdoor Furniture Collection. Solid, chunky Grade-A Teak and gorgeous Sunbrella® Cushions make this outdoor collection not only a stunning looking set of furniture, but also a comfortable, versatile collection as well. 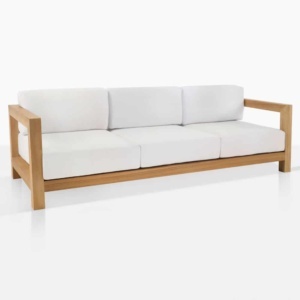 Made up of three key pieces, the Ibiza Teak Outdoor Furniture Collection boasts a 241cm long Sofa, a 168cm Loveseat and a 91cm Club Chair, all 91cm deep – meaning that each piece is cushy, comfortable and spacious! Purchase separately or together to create the look that will suit your space. Grade-A Teak is the main ingredient in the tremendous Ibiza Collection, filled with oodles of natural rubber and oil garnered from its age. With Grade-A, you are assured that this teak is plantation teak that has had at least 40 years to develop natural rubber and oil giving it its beautiful look and its epic strength! There is a reason why Design Warehouse has chosen this to be our signature product for over 20 years. Because it lasts. The icing on the cake of course are our plush Sunbrella® cushions, filled with premium QuickDry® foam – these are cushions that don’t need to be brought in after every shower. They can withstand the heat and harsh UV rays and they are super easy to clean! These fantastic materials make up a huge contingent of products at Design Warehouse, however we have even more to show you! From All Weather Wicker, to Raw Concrete, to Sunbrella® and Batyline® fabrics and Stainless Steel – all these materials and more make up our loungers, daybeds, deep seating, umbrellas, dining sets and planters – we have it covered for all your outdoor furniture needs! Design Warehouse is proud to supply to clients all over the country and all over the world! We are able to provide you with luxury furniture at wholesale prices. Email us, call us or enquire online – we can provide a quote swiftly and give you shipping options. Edgy, sophisticated and yet welcoming, the Ibiza Teak Outdoor Furniture Collection is a beautiful set for your home. Make your garden a haven for quiet drinks and nibbles during the warmer months with a Sofa, and three or four Lounge Chairs. Place a few Concrete Stools around to double as both extra seating and an accent table for your guests and enjoy the glamorous collaboration of mixed materials in a stylish setting. Maybe your apartment balcony needs a relaxing chair? Purchase the Ibiza Teak Outdoor Club Chair with a simple side table and have a space to unwind after a long day at work. 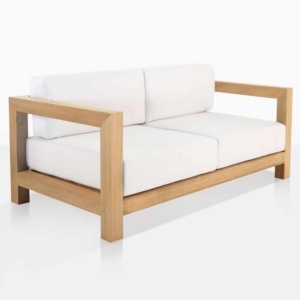 The Ibiza Teak Outdoor Furniture Collection is a fantastic suite for a modern home or a country estate. Call us today for more ideas on how to configure your set. We are only too happy to help. Comes with FREE Sunbrella® cushions as shown!